To enjoy the benefits of WASAC you need to join! For further information please contact Brendon DeGois or Brianne Yarran, your WASAC Chairperson. The Western Australian Students Aboriginal Corporation is the Indigenous student body on campus. WASAC has been responsible for organising social and cultural awareness activities for students to get involved in on and off campus since 1988. Currently representing over 230 Indigenous students, WASAC's main focus is meeting students' needs, promoting cultural awareness on campus, and providing a good social atmosphere in and around Shenton House and Old Pharmacology, with social functions such as sundowners, quiz nights and barbecues. WASAC is also involved with other Indigenous networks within Perth and around Australia. Each year it sends a team - the Western Waagyls - to compete in the Indigenous Nationals (formally the National Indigenous Tertiary Education Student Games (NITESG)). WASAC encourages its members to speak to prospective students from around the State through the Outreach Programs run by the School of Indigenous Studies. Members of WASAC have also had the chance to travel around the state, interstate and also overseas for various conferences and workshops. In 2014 UWA hosted the 19th Indigenous Nationals which UWA won for a record 7th time. This year, UWA will again host the 24th Indigenous Nationals in an attempt to become the most successful team ever and win an 8th Championship. 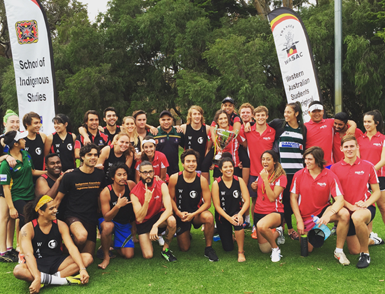 The Nationals, now held during the mid-year break, will this year be held 23 - 27 June and it provides a unique opportunity to bring together Aboriginal and Torres Strait Islander university students from around the country to participate and compete at a national level in mixed sports including basketball, netball, volleyball and touch football as well as an Indigenous cultural game. Since its inception in 1995, the aim of the gathering has been to promote unity, interaction and friendly competition between Aboriginal and Torres Strait Islander tertiary students. The Nationals offer an opportunity to promote Aboriginal and Torres Strait Islander people and culture in a positive light, and each year the Nationals receive increasing exposure in both mainstream and Indigenous media. The Western Waagyls, until recently, were the only Western Australian representatives at the Nationals and have competed at the Nationals since 2000 and performed admirably. So far the Western Waagyls have won seven championships (more than any other university) and have been placed runner-up four times. If you are an Indigenous student from UWA and would like to attend the Nationals as a competitor please contact Brendon DeGois or speak to a WASAC committee member to express your interest. For universities around Australia who are interested in attending the 24th Indigenous Nationals, please keep an eye on the Nationals Facebook page for updates or check out the UniSport Australia Indigenous Nationals webpage.